The VanEck Vectors Semiconductor ETF, which trades under the ticker SMH, saw its biggest downturn since November 2008 on Wednesday. It's been a tough week for semiconductor-related stocks after disappointing earnings from Advanced Micro Devices and Texas Instruments and an ongoing trade war between the U.S. and China. Chipmaker Nvidia meanwhile posted its worst day since May 2011. 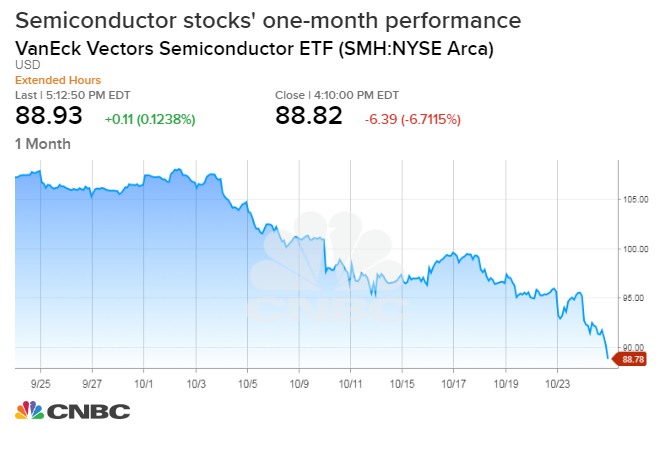 Semiconductor stocks had their worst day in a decade Wednesday after a slew of disappointing earnings from leading chipmakers and a sell-off in the broader markets. The VanEck Vectors Semiconductor ETF, which trades under the ticker SMH, closed down 6.7 percent — the biggest downturn for the group since November 2008. Chipmaker Nvidia meanwhile posted its worst day since May 2011, down 9.8 percent for the day. It's been a tough week for semiconductor-related stocks. Shares of chipmaker Advanced Micro Devices, or AMD, fell as much as 18 percent in extended trading Wednesday after the company reported third quarter revenue that missed Wall Street estimates. Also on Wednesday, Texas Instruments tumbled after disappointing quarterly earnings and lowered outlook. Major components of the SMH have been trading firmly in a bear market amid the U.S.-China trade war, and concerns around China's economic growth. The White House implemented 10 percent taxes on $200 billion worth of Chinese imports in September. Those tariffs are set to rise to 25 percent by January 1 and could affect products manufactured with semiconductors. "What concerns us is most of the companies in the index are trading at super-high valuations, you may see demand slowing, and the perception is such that with these trade and tariff wars, with everything going on in China and across the U.S., that people are concerned with how this settles out," Matt Maley, equity strategist at Miller Tabak told CNBC's Trading Nation Wednesday. The tech-heavy Nasdaq Composite fell 4.4 percent to 7,108.40— entering correction territory — with its worst day since 2011 on Wednesday.